Robert Smith married Mary French, daughter of Thomas French and Mary Scudamore. Samuel Smith Sr. was the son of Robert Smith and Mary French. Child of Samuel Smith Sr.
Samuel Smith Jr. was the son of Samuel Smith Sr.
Child of Samuel Smith Jr.
Asael Smith was the son of Samuel Smith Jr.
Joseph Smith Sr. was the son of Asael Smith. Child of Joseph Smith Sr.
Joseph Smith Jr. was born on 23 December 1805. He was the son of Joseph Smith Sr.
Joseph Smith Jr. married Emma Hale, daughter of Isaac Hale and Elizabeth Lewis, on 17 January 1827. 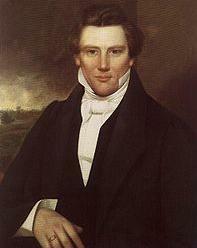 Joseph Smith Jr. died on 27 June 1844 at age 38. Joseph Smith, Jr. was the founder of the Latter Day Saint movement and an important religious and political figure in the United States. In 1827, Smith announced that an angel had given him a set of golden plates describing a history of ancient American peoples. He said that he translated these plates by the gift and power of God. Smith then published the resulting narratives as the Book of Mormon. Based on this book and a series of revelations, Smith founded the Church of Christ in western New York, claiming it to be a restoration of early Christianity. Married Name 17 January 1827 As of 17 January 1827,her married name was Smith. Emma Hale was born on 10 July 1804. She was the daughter of Isaac Hale and Elizabeth Lewis. Emma Hale married Joseph Smith Jr., son of Joseph Smith Sr., on 17 January 1827. Emma Hale died on 30 April 1879 at age 74. Emma Hale Smith Bidamon as married to Joseph Smith, Jr., until his death in 1844, and was an early leader of the Latter Day Saint movement, during Joseph Smith's lifetime and afterward as a member of the Reorganized Church of Jesus Christ of Latter Day Saints (RLDS, now the Community of Christ). Isaac Hale married Elizabeth Lewis. Elizabeth Lewis married Isaac Hale. Married Name 30 September 1308 As of 30 September 1308,her married name was de Burgh. Elizabeth De Clare was born on 16 September 1295. She was the daughter of Gilbert De Clare and Joan of Acre. Elizabeth De Clare married John de Burgh on 30 September 1308. Elizabeth De Clare died on 4 November 1360 at age 65. Elizabeth de Clare (16 September 1295 –4 November 1360) was the heiress to the lordships of Clare, Suffolk in England and Usk in Wales. She was one of three daughters of Gilbert de Clare, 7th Earl of Hertford and Joan of Acre, and sister of the infant fourth earl, also Gilbert de Clare. She accompanied her brother Gilbert to Ireland for their double wedding to two siblings: the son and daughter of the Earl of Ulster. Elizabeth married John de Burgh on 30 September 1308. He was the heir to the Earl of Ulster, and Elizabeth could expect to be a countess. She gave birth to their only child, a son, in 1312; he would become William Donn de Burgh, 3rd Earl of Ulster. Only a year later, her husband John was suddenly killed in a minor skirmish. Now a widow, Elizabeth remained in Ireland until another family tragedy demanded her return. Her brother Gilbert was killed at the Battle of Bannockburn in 1314 aged only 23 and, as he left no surviving issue and had no brothers, his property was equally divided between his three full sisters, Elizabeth, Eleanor and Margaret. Suddenly Elizabeth was one of the greatest heiresses in England. Her uncle, King Edward II, recalled her to the land of her birth so he could select a husband for her. She left Ireland in 1316, leaving behind her young son, William. Elizabeth never returned. Edward II placed her in Bristol Castle, but his plans to marry her to one of his supporters were dashed in February 1316, when Elizabeth was abducted from Bristol by Theobald II de Verdun, the former Justiciar of Ireland. He and Elizabeth had been engaged before she was called back to England. She was Lady Verdun for only six months however, for Theobald died on 27 July 1316, at Alton, Staffordshire, of typhoid. He left behind three daughters from a prior marriage and Elizabeth, who was pregnant. She fled to Amesbury Priory, where she stayed under the protection of her aunt Mary de Burgh, who was a nun there, and where Theobald's posthumous daughter, Isabel de Verdun, named after the Queen, was born on 21 March 1317. Just a few weeks later after Isabel's birth, Edward II married Elizabeth to Sir Roger D'Amory, Lord D'Amory, Baron of Armoy in Ireland. John de Burgh married Elizabeth De Clare, daughter of Gilbert De Clare and Joan of Acre, on 30 September 1308. Married Name Her married name was Cavendish Bentinck. Caroline Louisa Burnaby married Charles William Cavendish Bentinck, son of William Charles Cavendish Bentinck and Anne Wellesley. Caroline Louisa Burnaby was born in 1832. She was the daughter of Edwyn Burnaby and Anne Caroline Salisbury. Edwyn Burnaby married Anne Caroline Salisbury, daughter of Thomas Salisbury and Frances Webb. Edwyn Burnaby was born on 29 September 1798. He was the son of Edwin Andrew Burnaby and Mary Browne. Married Name Her married name was Burnaby. Anne Caroline Salisbury married Edwyn Burnaby, son of Edwin Andrew Burnaby and Mary Browne. Anne Caroline Salisbury was born circa 1805. She was the daughter of Thomas Salisbury and Frances Webb. Anne Wellesley married William Charles Cavendish Bentinck, son of William Henry Cavendish Bentinck and Dorothy Cavendish. Anne Wellesley was born in 1788. She was the daughter of Richard Wellesley and Hyacinth Roland. King George V of the United Kingdom married Mary of Teck, daughter of Prince Francis of Teck and Princess Mary Adelaide of Cambridge. King George V of the United Kingdom was born in 1865. He was the son of King Edward VII of the United Kingdom and Alexandra of Denmark. King George V of the United Kingdom died in 1936. Married Name Her married name was Windsor. Mary of Teck married King George V of the United Kingdom, son of King Edward VII of the United Kingdom and Alexandra of Denmark. Mary of Teck was born in 1867. She was the daughter of Prince Francis of Teck and Princess Mary Adelaide of Cambridge. Mary of Teck died in 1953. King Edward VII of the United Kingdom married Alexandra of Denmark. King Edward VII of the United Kingdom was born in 1841. He was the son of Albert of Sax-Coburg and Gotha and Queen Victoria of England. King Edward VII of the United Kingdom died in 1910. Married Name Her married name was of the United Kingdom. Alexandra of Denmark married King Edward VII of the United Kingdom, son of Albert of Sax-Coburg and Gotha and Queen Victoria of England. Alexandra of Denmark was born in 1844. Prince Francis of Teck married Princess Mary Adelaide of Cambridge. Married Name Her married name was of Teck. Princess Mary Adelaide of Cambridge married Prince Francis of Teck. George Smith married Frances Mosley. Frances Mosley married George Smith. Richard Wellesley married Hyacinth Roland. Richard Wellesley was born on 20 June 1760. He died on 26 September 1842 at age 82. Married Name Her married name was Wellesley. Hyacinth Roland married Richard Wellesley. Hyacinth Roland was born in 1766. Edwin Andrew Burnaby married Mary Browne. Mary Browne married Edwin Andrew Burnaby. Thomas Salisbury married Frances Webb. Married Name Her married name was Salisbury. Frances Webb married Thomas Salisbury.